March 2019: Sandra Gibson looks at the cultural, culinary and medicinal importance of a commonly grown garden shrub: Rosemary. 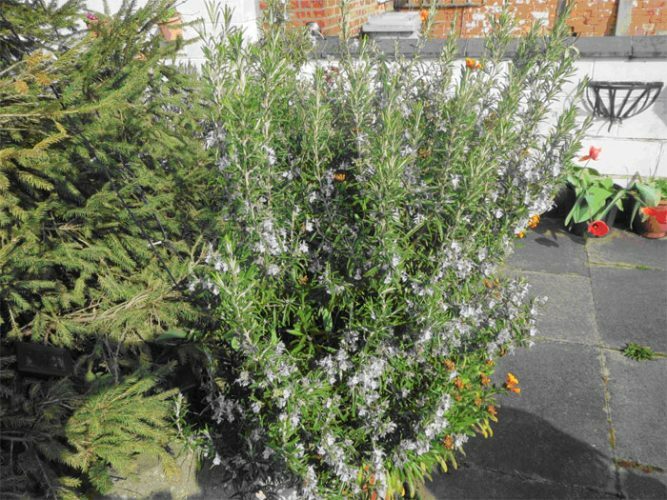 Rosemary is a drought-tolerant aromatic shrub and I have been growing it for years. As long as it doesn’t get waterlogged, this native of the Mediterranean and of Asia survives in poor soil – preferably alkaline – in our temperate climate. Its Latin name Rosmarinus means dew of the sea and anyone who has visited Llandudno will realise that this herb thrives by the seaside. It is such a familiar sight in my garden that I have taken it for granted, but early this spring, for the first time, it flowered. I felt really joyful to see the tiny pale blue flowers contrasted against the dark conifer green of this otherwise visually unremarkable shrub. The leaves are small spikes, dark green on one side and silver on the underside, and you can feel the slight stickiness of the essential oil if you rub them. The astringent scent released is woody and freshly fragrant and food flavoured with it acquires a slight charred wood taste. Jamie Oliver recommends using stripped, wetted Rosemary twigs as skewers for barbecued food. Its affinity with lamb is well known but it can also invigorate bland foods like potatoes and courgettes and there are more radical ideas, such as adding Rosemary to salted caramel and pistachio ice-cream. There are reputed health benefits, too. According to Culpeper, “It helpeth a weak Memory and quickeneth the senses,” and when smoked dry, in a pipe, “it helpeth those that have any Cough, or Phtisick, or Consumption”. From ancient times Rosemary has been used for alleviating muscle pain, for boosting the immune and circulatory systems, and for improving hair growth. Myths associate this herb with avoidance of the great plagues that used to sweep across Europe – Rosemary being one of the ingredients contained in Four Thieves Vinegar, a potion rubbed on the hands, ears and temples when approaching plague victims. Rosemary has insect-repelling properties which would hopefully discourage the fleas which carried the plague bacillus. The colourful name of this preventative remedy refers to a tale linking it with robbers pillaging the belongings of victims. The use of the vinegar and herbs made it safe for them to do their gruesome work and when apprehended, they offered the recipe in exchange for leniency. Rosemary oil is a psychic protector, and as such it is particularly useful to use first thing in the morning before exposing oneself to all the external influences, both those of which we may be aware and possibly fearful and those of which we are not aware … It is particularly appropriate to use Rosemary in the morning because at a physical level it is a stimulant and to use this oil later in the day may result in sleeplessness … In relation to the chakras, Rosemary is particularly relevant to the Brow Chakra. In physical aromatherapy it is known as a cephalic oil … one which stimulates the brain and mental activity. At a subtle level, Rosemary is associated with qualities of clear thought and clear-sightedness … at the most subtle level it may help the development of clairvoyance. Patricia Davis. There are health warnings associated with this plant oil: its use is contra-indicated during pregnancy and in those who have high blood pressure. Rosemary is one of those easy plants that really earn their living. Besides having culinary and medicinal virtues, it makes a good hedge, which doesn’t grow too quickly and which keeps its foliage in winter. You can get a lovely deep blue flowered variety as well as the common pale blue one and there are pink and white types too. Legend has it that the prototype Rosemary flower was white, but the Virgin Mary placed her cloak on the shrub and this miraculously turned the flowers blue – a colour associated with the Mother of Christ. Incidentally, it is believed that Rosemary refuses to grow in the gardens of evil people; my Rosemary plants are growing quite well – so phew! 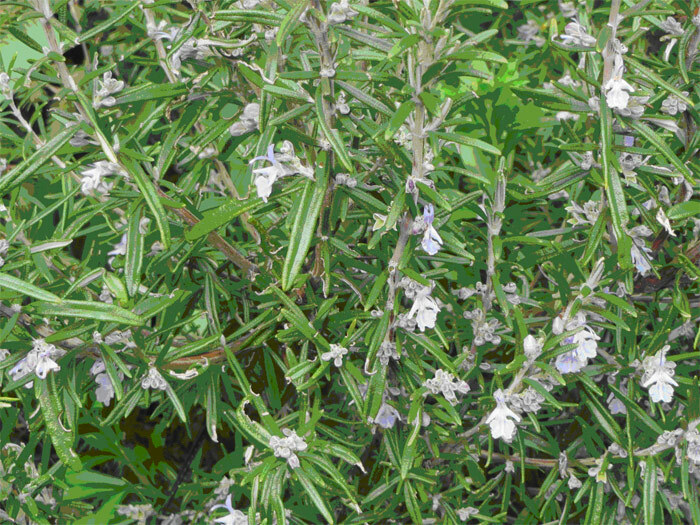 In ritual terms, Rosemary has been linked with remembrance. At funerals it is often thrown into graves; in Australia sprigs are worn on ANZAC Day and sometimes on Remembrance Day. In the past bridal bouquets contained it because its link with remembrance associated it with friendship and love. We all remember the poignant scene in Hamlet where Ophelia reminds Hamlet, “There’s Rosemary, that’s for remembrance”. At one time people grew plants for their usefulness more than for their beauty. In an age predating a health service, people had to grow and know their plants because they were the main source of remedies for ailments. 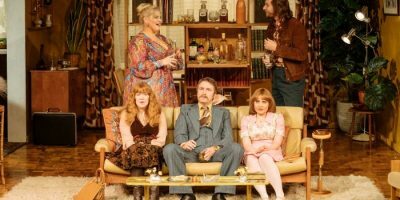 The age of science moved us away from what was dismissed as folk medicine but in recent decades we have become alarmed at the power of big Pharma and more sceptical about the undiscriminating use of drugs, especially antibiotics. There has been a resurrection of trust in the remedies which grew in people’s gardens, especially since science has given some credence to them.